Mon Voyage à la France! Hello my friends, it’s been a really long time! Before you ask me why I haven’t been keeping you up-to-date, let me just say that I’ve been busy traveling and exploring the world, to say the least! A lot has happened since the last time I posted, so we definitely need to catch up. My impression when I saw the Eiffel Tower for the first time. 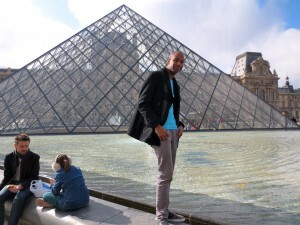 Me at the Musée du Louvre! Anyway, when I finally arrived to Paris, I could not believe my eyes. When I got out of the train station, the first thing I said to myself was, “man, this is a beautiful city!” I immediately bought my unlimited Metro pass, made my way to my hostel, and made myself comfortable as I waited for my friends to meet me there from Italy. Oh, before I forget, you all know how obsessively organized I am, so needless to say that I brought a well planned out four-day itinerary with me. When I got to Paris, I already knew what trains to take, where to go, how to get there and everything! 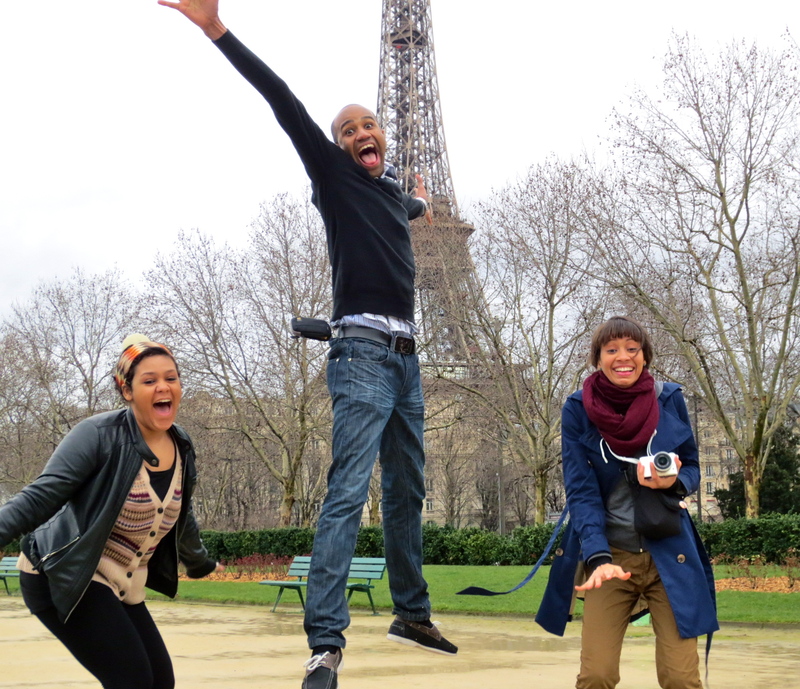 My friends looked at me like I was crazy, but they surely took advantage of it because we went everywhere in Paris, and when I say everywhere, I mean EVERYWHERE! Our first day started out with a nice walk at the city center. We took the train to the city center around noon and did not come back to our hostel until 11:00 at night. We started out with the most touristic things like the Eiffel Tower, Place de la Concorde, Arc de Triumph, etc. Walking through the streets of Paris was delightful… I have no words to describe how beautiful this city is. Walking along the Seine River, and overlooking all those historic sites, bridges, famous streets, and the Eiffel Tower from every single corner was one of my favorite things about Paris. But if you think that Paris is beautiful during the day, then you have not seen it at night because I’m sure you would be speechless. 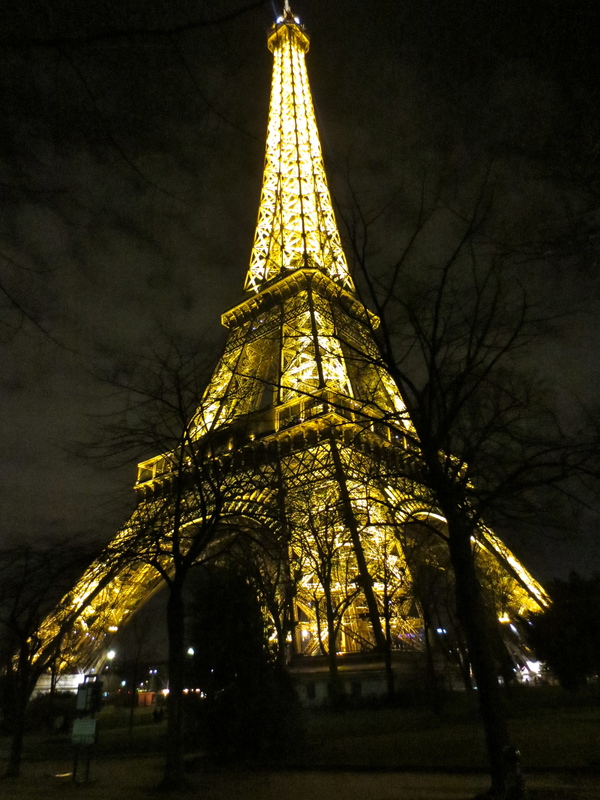 I fell in love with Paris! My friends and I were lucky enough to have nice weather with temperatures in the high 50s and sunny, which made it even better. After a long day, we got a nice dinner at a local restaurant, and continued to do more sightseeing at night. When we got back, we realized that our hostel had a really nice social area, so my friends and I decided to socialize there with some people for the rest of the night. We were so tired, that after two hours there, we were ready to go to bed and get ready for the next day, which according to my itinerary was supposed to start at 9:00 a.m.! On our second day in Paris, we took a boat tour on the Seine River, got lunch out on the sun, visited Notre Dame, Musee du Louvre, Lock Love Bridge (one of the most romantic bridges in the world), Opera Garnier, got a nice view of the city from the Eiffel Tower, and much more. After spending the whole day exploring the city, we had dinner at a very French restaurant, went back to the hostel and got ready to experience the Paris nightlife! We met some other friends at the hostel (with whom I still keep in contact with today), and went out with them. We visited the world-famous Moulin Rouge and other great places! 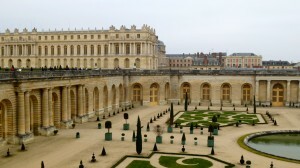 On the next day, we took a day trip to the city of Versailles and visited the Palace of Versailles. 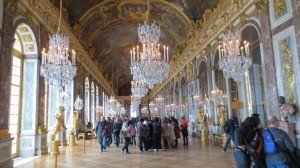 The palace is one of the most beautiful things I have ever seen in my life. 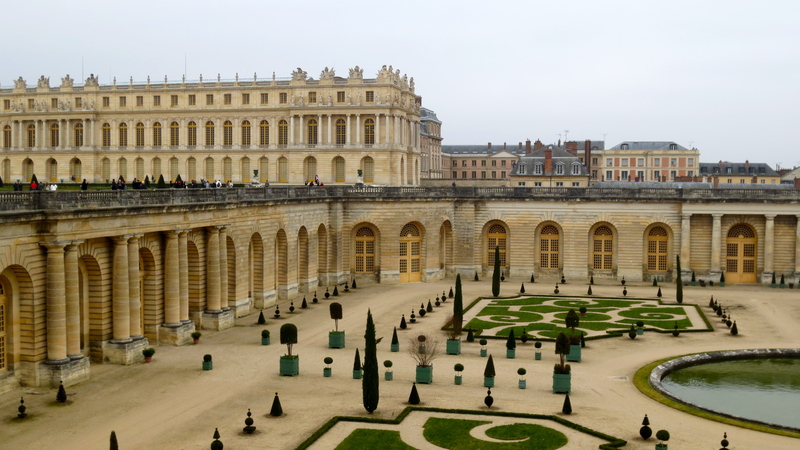 My friends and I walked for hours inside and outside the palace, and still did not get to see everything. That’s how huge this palace is. This is a breath-taking place. I hope the pictures can explain how amazing this place is because to be honest, I can’t. All in all, I had a great experience in France. I am looking forward to visit the South of France someday. 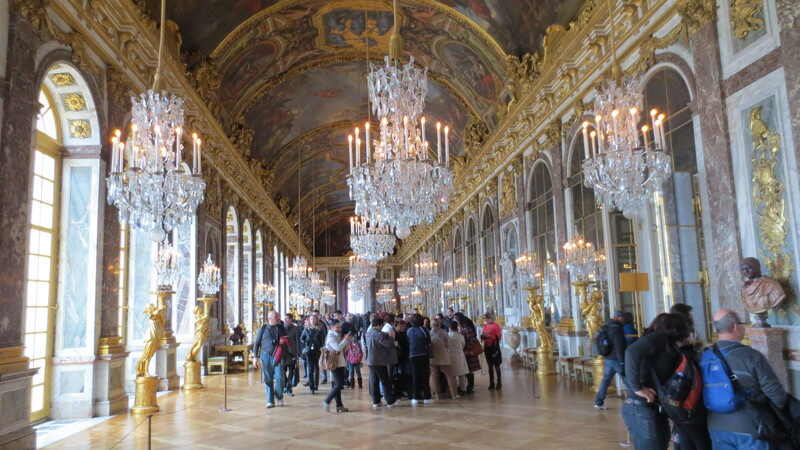 Besides all the beautiful sites, and great experience in France, I had many other impressions. I was impressed at how delicious French food was. Oh my God, I wanted to stay there a few extra days just for the food (I’m serious about this one). Food was sky-rocket expensive though… that was the only downside to it. By the way, I just remembered a really funny story… so on one of the nights that my friends and I went out to eat, one of us ordered a Bailey’s Cheesecake (cheesecake with caramel) for dessert, and instead of getting caramel on top of the cheesecake, we got barbecue sauce on it. We all thought it was a cultural thing until we asked and found out that the chef had confused the caramel with barbecue sauce! Hahaha LOL. Still to this date, every time I remember this, my friends and I laugh for like 10 minutes! This little story will always remind me of my time in Paris… it didn’t taste bad after all! Another big impression of Paris was the smell. I had always heard tourists say awful things about the bad hygiene in France, and I always thought it was a stereotype; boy were these tourists right! I realized that the city wasn’t very clean (compared to other European cities I have been to), and the train stations smelled really bad. I figured this may be due to the fact that the French government leaves train stations opened all night long so that homeless people have a place to sleep (in comparison to London, where train stations close at a certain time). Also, I realized that in Paris, they touch the food with their hands when selling it to customers. For instance, if you order bread from a bakery, they won’t use gloves to pick the bread; they will most likely touch it with their hands (ew, that was kind of gross). Also, it is not a stereotype, but PICK-POCKETING is very common in Paris, and people work in pairs… so if you ever go to Paris, be careful. It happened to a lot of my friends that have been there and it almost happened to me as well! Oh, I almost forgot to tell you that I got to practice my French a lot! Let me tell you something, if I did not know any French, my friends and I would have been screwed because these people speak no English, except for the younger generation. I was also surprised at some of the technologies they use over there. For example, at most of the train stations in Paris, they had glass doors that covered the gap between the trains and the platform. These doors would only open when the train arrives and close right after it leaves. I thought this was a great idea because it minimizes the common accidents that happen every once in while in cities like New York City where people try to commit suicide. Also, all throughout the city, there were public bathrooms that would automatically clean right after one finished using it. Furthermore, you don’t have to wait in lines at some fast food restaurants because you place your order through a machine and then wait for your number to be called so you can pick-up your food. That city was too fancy for me! Well, I guess I’m gonna have to write another blog about my other travel experiences because I got carried away writing about France. That’s how much I loved it!